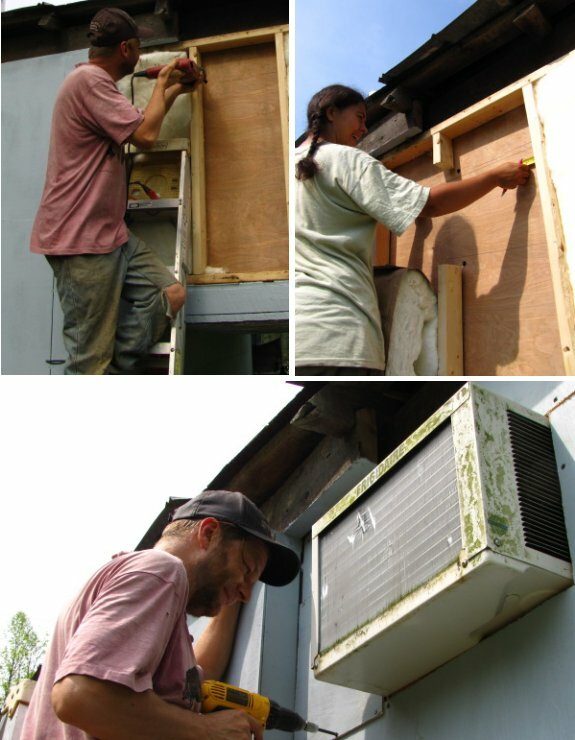 One problem I've always seen with these window air conditioners was the limited choices a house or trailer might have when looking for an appropriate installation spot. I've had several of these through the years and I often found myself standing in front of it so I could receive the full effect of the chilled air thinking it sure would be nice to have this artificial cool breeze blowing on me over there in that chair. It took Anna and me a little over 2 hours to make the above custom fit. Now I can sit within inches of the Arctic winter blast. I'm in TX, and I don't guess going long without any sort of cooling where y'all are at would be very fun. Glad to see you got something working there! I tend to do without --- I've noticed that my body acclimates after a while. Mark very kindly gave in to me this year and tried to acclimate to the hot weather, but it only worked partway for him. He seemed much more able to work in the heat, but when the humidity stayed in the 90s and the temperature was in the high 80s, he was clearly cooking. When I was in Singapore once, I got a terrible cold from switching between the equatorial heat and humidity and the air-conditioned hotel (that felt like it was freezing in comparison) several times a day. OTOH, I've worked in an office under a tin roof where the temperature would get up to 100 F in the summer (without A/C). I was very glad when we got airco there! The difficulty of switching between temperatures is my main reason for not wanting AC (except for my skinflint tendencies, which might be a more major reason.) I know that my body has trouble when it's 90 degrees one day and 40 degrees the next, and AC seems to mimic that daily. On the other hand, there do seem to be extremes beyond which the human body just can't cheerfully stretch, and I think we found Mark's limit. you could pump water from the creek through a radiator with a fan on it and cut the power consumption in half.